The reasons for choosing commercial fencing are very similar to residential fencing. 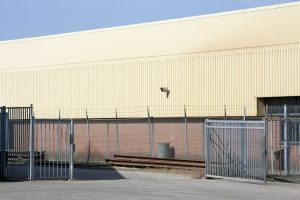 When figuring out what fencing to choose for your commercial property, the factors you consider are very similar to those you would consider when choosing a fence for your home. Just like for your home, the fence for your commercial property should increase appearance, privacy, and security. The importance of privacy really depends on the type of business you own and where your business is located. If you’re near a more residential area, consider a wooden or vinyl privacy fence. This way, your clients retain their privacy and your business doesn’t stick out like a sore thumb. For businesses inside buildings, the type of fencing is up to the building owner. Security is usually the main reason for installing a fence on a commercial property. For this purpose, chain-link fencing is both effective and cost efficient. Solid barriers may seem more secure, but that’s not always the case. You don’t want your security fence to give potential intruders a good place to hide. Chain-link and wrought-iron fencing are both good secure, yet see-through fencing options. Keep in mind, though, that while wrought-iron may look more attractive than chain-link, it is also quite a bit more expensive. Be sure to weigh all of the pros and cons for all of your options. While privacy and security are both very important fencing considerations, how the fence looks is also important. The wrong fence can make your business appear unapproachable. Choosing the right fencing for your business, however, can actually increase your curb appeal and potentially your customers. There are many, many options out there for commercial fencing that will accentuate your property and keep your business safe. Good curb appeal can help you attract business from people passing by. Ornamental fencing is a very popular choice for this. Business owners in rural areas may prefer the 3-rail vinyl fence or a wooden fencing option that better fits the area. Vinyl fencing is becoming more and more popular because it is so easy to maintain, lasts a long time, and is available in a wide variety of colors and styles, making it easy to find the best fencing for your commercial property. This entry was posted on Friday, August 4th, 2017 at 10:57 am. Both comments and pings are currently closed.